is displaying that annoying spinning wheel? Less Stress Computer Services provides reliable and affordable laptop repairs. 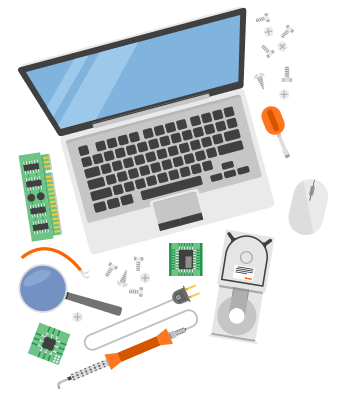 When it comes to laptop repairs we understand the inconvenience of your laptop being out of action and offer a quick repair to get you back on track. Our skilled technicians can diagnose and repair a variety of laptop issues promptly. Depending on the extent of the problem or error, we can repair Windows without having to reinstall a new operating system. In some cases, Windows may need to be reinstalled completely – no need to worry though – your important files and data will be saved before your operating system is reinstalled. If the drivers and programs that allow your laptop operating system to work are deleted or corrupted, then you may experience blue screens, freezing, or crashes. If the hard disk fails, you will no longer be able to access your important data. In situations like this, we can help. 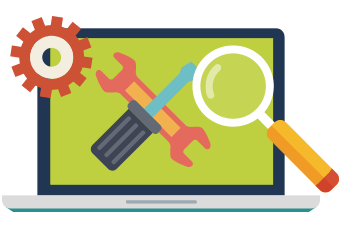 Here at Less Stress, our laptop repairs team can solve any problem you are facing and get your laptop working again in no time. There are many common laptop problems that occur – it could be software or hardware issues, internet connection issues, windows reinstallation, motherboard issues, driver not found errors and more. If you are experiencing any laptop issues at all, bring it to Less Stress Computer Services for reliable laptop repairs in Brisbane. Our technicians have the knowledge and advanced tools to repair all brands of laptop. We strive to complete repairs as quickly as possible. No matter the repair, our team of experienced technicians is well equipped to provide quality services to all our clients. We take pride in offering our customers top quality, friendly and affordable laptop repairs in the Brisbane region. Our in-house technicians are trained and dedicated to providing all our clients with the timeliest and most satisfactory repair service possible. We will resolve any technical issue your laptop may have – we service and repair all major brands. When you need a repair done, don’t settle for second best – hire a first rate technician who offers a quality repair service and knows how to get it done on time. Less Stress Computer Services is committed to taking away the stress and worries of laptop repairs in Brisbane. This is why we are called ‘Less Stress’. Contact us today for quality and affordable laptop repairs.